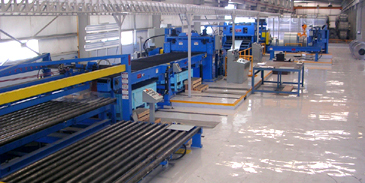 Tijuana, Mexico - JFE Shoji Steel America, a distributor and processor of close-tolerance carbon steel strip has installed a Braner/Loopco Cassette Leveler/Servo-Feed Cut-to-Length Line in its Tijuana Mexico facility. 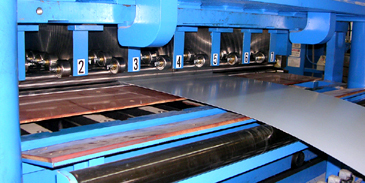 The new precision Cut-to-Length/Blanking Line converts 20-ton x 60" wide surface-critical coated and bare carbon steel coil in gauges from .016" through .125" into precise length panel flat sheets and side-trimmed blanks. 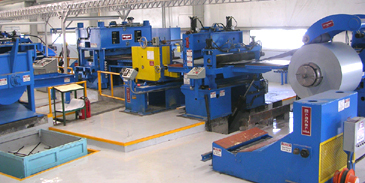 Equipped with a Stub Arbor Side Trimmer, computer controlled Hydraulic Cassette Leveler, a Precision AC Servo-Feed, and a Hi-Speed Hydraulic Shear, the new CTL Line generates precise sheets and blanks at production rates to 50+ PPM. 60" x .125"/.016" Cassette Leveler/Servo Feed CTL/Blanking Line. Top-Bottom Pay-Off Entry Section: Master coils are transported and loaded onto the CTL Line via Floor Level Coil Car. The Coil Car is equipped with adjustable coil stabilizers to handle narrow width coils and a hydraulic "snubber" roll that assists bottom coil threading. The Uncoiler can unwind the coil from the top or bottom to generate sheets/blanks with a coated side up or down. 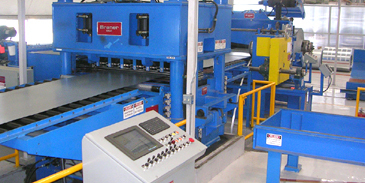 A Telescoping Blade Peeler and Non-Marking Pinch Rolls quickly threads the coil into an Entry Shear where heads and tails can be removed and coils "split" for re-stocking. Entry Section allows coils to be unwound from top or bottom. Side Trimming: A Side Trimmer is installed after the Entry Section and ahead of the Cassette Leveler to generate precision width blanks. The Trimmer is equipped with rotary cutters mounted on DC motor driven stub arbor housings. The stub arbor housings are pushbutton positioned for precise strip width adjustment. Vertical and horizontal knife clearances are adjustable for processing a gauge range from .016" through .125". Computer Controlled Hydraulic Cassette Leveler: A massive 4-post "Cassette" type corrective Leveler equipped with interchangeable Cassettes delivers panel-flat surface-critical sheets and blanks throughout the entire .016" - .125" gauge range. A 1.250" x 17-Roll x 7-Adjustable Flight x 5-Hi Cassette levels gauges from .016" through .062". A 1.750" x 17-Roll x 7-Adjustable Flight x 5-Hi Cassette is employed for leveling gauges from .028" through .125". A Cassette can be ejected from the 4-Post Leveler Frame and replaced with another Cassette via pushbutton in just a few minutes. Benefits of the Cassette Leveler include a wide gauge and product range, simplified work roll, back-up, and universal shaft maintenance, and improved "up-time" because roll cleaning & maintenance is accomplished while the Leveler remains in operation with another Cassette. Sub-Arbor Side Trimmer generates precision width strip. 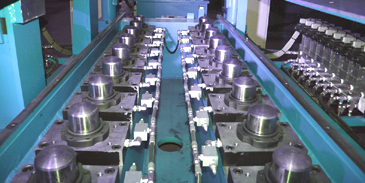 Cassette Leveler employs multiple Cassettes for processing a .016" - .125" gauge range. 1.250" x 17-Roll x 5-Hi Cassette, leveling .018" Side-Trimmed Electro Galvanized Coil. Hydraulic Leveler Roll Positioning: The JFE Shoji Cassette Leveler employs hydraulic cylinders rather than mechanical screws and sliding wedges to position its work rolls. Hydraulic cylinders mounted in the 4-post Leveler frame mate with the entry and exit ends of each Cassette back-up flight. View inside a 4-Post Cassette Leveler Frame shows linear transducer controlled hydraulic cylinders, which adjust Cassette back-up flights.